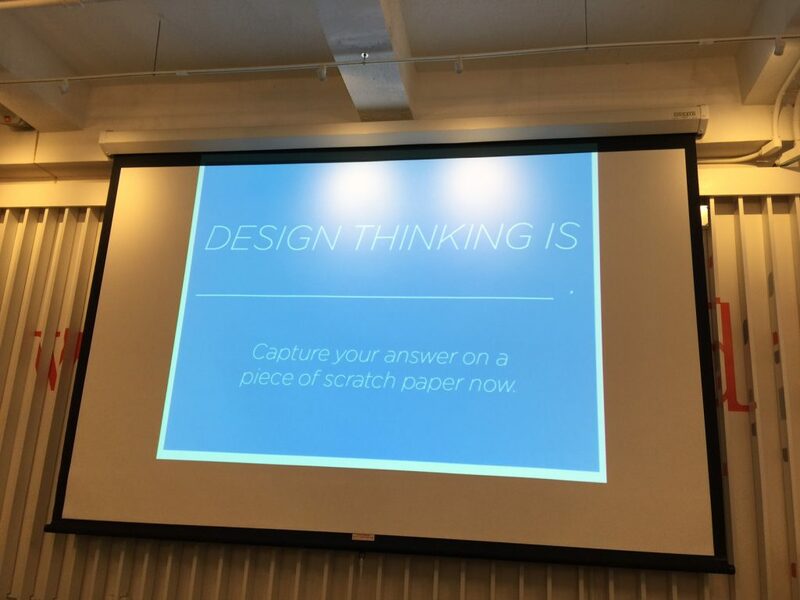 Last Tuesday, I attended the “Design Thinking Crash Course” hosted by The Design Gym. It was the first Meetup that I paid for and was pleasantly surprised by the quality. For $33.00, you get three solid hours on developing a design thinker’s mindset and applying it to realistic examples. I had a great evening of learning how to embrace that mindset and exchanging ideas with such a diverse group of people. While some of the material is relatively fresh, I’d like to share with you what I learned. Here is my review of the course along with my takeaways. This workshop is hosted every month for people who are curious about design thinking or want to sharpen their understanding of it. All you need to do is bring yourself and an open mind. Laptops and other equipment are not necessary. They also offer a full-day Design Thinking Bootcamp every month as well for anyone interested in going all out. Go check out their website for more information on the courses they offer. First, I was impressed with how engaging and solid the course was for the entirety of three hours. I used to teach three-hour ESL lessons and let me tell you, it’s no walk in the park. I have so much appreciation and respect for the team that created the lesson plan. The activities were crafted well and executed flawlessly. My instructor was Riley and he built rapport with everyone instantly. He made sure that we were on the same page and that there was never a dull moment. If there were any concerns, he addressed them immediately. To get our minds warmed up, we started out by filling in, “Design thinking is _______.” My answer was that design thinking is a holistic approach to solving problems and creating value to users. There was a consensus in the room that design thinking is an approach to responding to needs that is intuitive, innovative and collaborative. A lot of great ideas were thrown around by a lot of great thinkers. Next, we planned the most epic party with an unlimited budget and disregarded logistic difficulties. In the first round, we paired up and brainstormed ideas for the party. One person puts out ideas and the other followed with “No, because…” and gave reasons why it wouldn’t work. In the second round, we found a new partner and brainstormed again. This time, the other followed it with “Yes, and…” to agree with the ideas and contribute a few of their own. 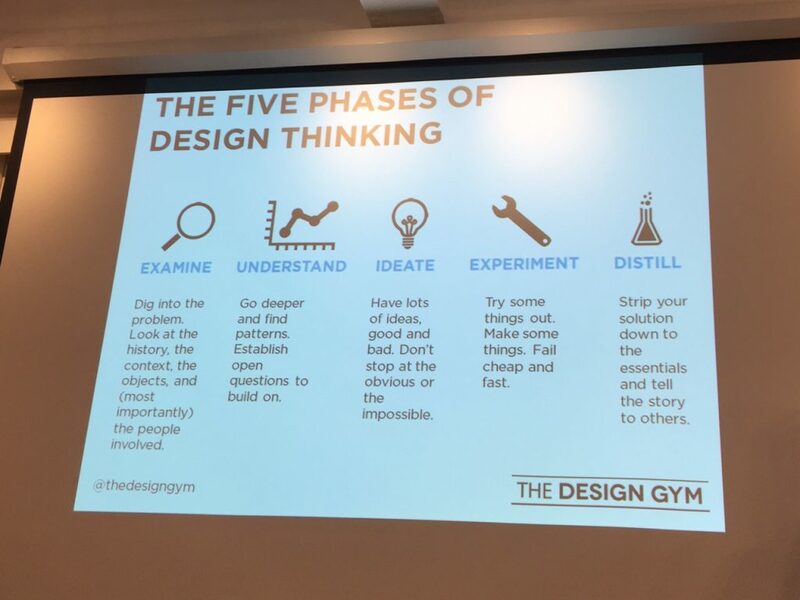 After that, we dove right in and were introduced to the five phases of design thinking. In the crash course, we focused on the first three which are examine, understand and ideate. The bootcamp goes into all five. Riley taught us what each of these three phases mean and gave us clear instructions for the activities that followed. These activities helped us understand the concepts and gave us the skills to apply them to real-life scenarios. With every activity, we found new partners and group members. We discussed the prompt, recaptured our ideas and brought them all together. This pattern of review, activity, review, activity, review, activity kept me engaged and focused at all times. During the shuffling of group members, I met teachers, designers, project managers, tourists and musicians. It was really a diverse group of design thinking enthusiasts and that made the evening enjoyable and memorable. Towards the end, we wrapped up everything we learned and shared our biggest takeaways from the evening. Every person shared something completely different from each other and some were unexpected. However, everyone agreed on how informative, engaging and fun the course was. Personally, I wouldn’t even mind doing it again just for the experience. Everyone learns something. 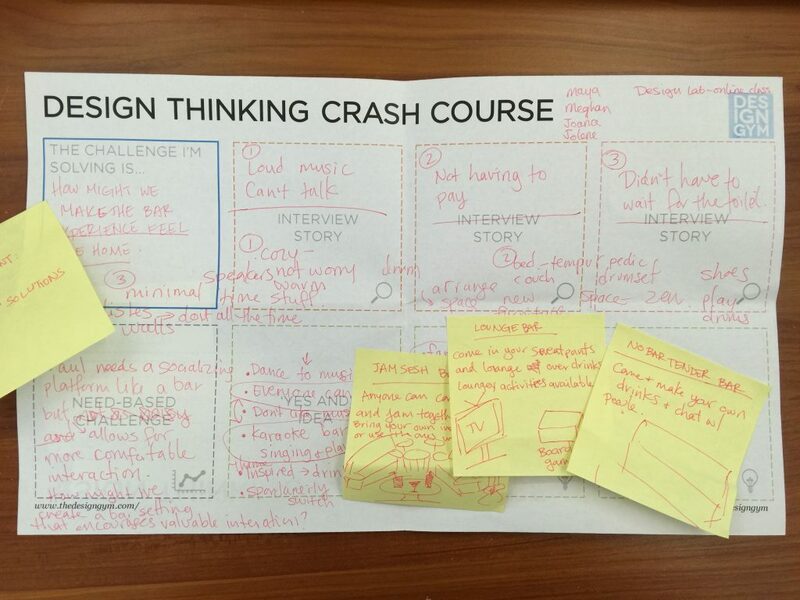 You can be an expert in design thinking and still benefit from this course. I was pleasantly surprised by a lot of the discussions that happened here because some of the advice went against common notions. Design thinking is a unique approach to problem solving so it definitely didn’t feel conventional. Having said that, it still felt approachable and easy to grasp. Here are my five biggest takeaways. Closers are the “No, because”-ers. They shut down ideas and explain why it won’t work. Openers, in contrast, are the “Yes, and”-ers. They agree with ideas and look for their own ways to contribute. While it’s agreeable to have more openers, both types of people are necessary to brainstorm and refine ideas. You need openers to ideate quickly and abundantly. You also need closers to evaluate ideas and bring up potential problems. Combining these personalities sounds like a disaster but when executed properly, it can absolutely work. Framing the need is a practice that is probably more important than identifying them. At one point, Riley showed us a picture of a young guy struggling to get out of bed and asked us to identify the need. Perhaps he needs a more trustworthy alarm clock. He may need another schedule that doesn’t force him out of bed early. He definitely needs a better haircut. From this example, we learned the various ways that a need can be framed. Framing the need allows people to create the best and most innovative solution that brings the highest value to the user. When we did popcorn style brainstorming, we were on major time constraints. In fact, the entire course was very limited in terms of time. There was a lot of material to get through so our partner activities were shortened down to five to seven minutes. However, some of us agreed these time constraints put more pressure on us and it helped us generate better ideas. I do agree to a certain extent and believe in the limit of time for better innovation. Imposing time constraints can actually be beneficial to effectively brainstorming and distilling those ideas. Iterating ideas and designs are crucial. It helps people identify problems early on in the process rather than later and makes it much easier to implement changes. Usually, most final versions are never what they started out. People should always be iterating to produce the best design possible for users rather than getting attached to the initial idea and sticking with it. Even as a child, we do things over and over. We learn how to do something different in the process that yields better results. At least for me, that’s how I learned to ride a bike properly. The same principle should be applied to designing. Ideas come and go so it’s crucial to always be writing them down. The sad thing is, once we lose an idea, it doesn’t come back. I used to depend on my phone to jot down ideas but I think I will commit to using my Moleskine more. In the split second I am wasting to open an app on my phone, I could have just written it down by hand. Nothing beats the traditional pen and paper. Take a look at all the notes and ideas I took down. One of the main reasons why I decided to participate in this event was because I’m interested in the research aspect of user experience. I’ve always considered myself a good researcher mostly because I’m genuinely curious all the time and go great lengths to find answers. This course definitely helped me sharpen my skill set by introducing a brand new way of thinking and learning how to apply it to practical situations. In conclusion, would I recommend it? Absolutely yes. Eventually, I might take their all-day bootcamp course on design thinking. If I am to participate in the all-day bootcamp, I want to be much more ahead in my knowledge of user experience so that I can fully take advantage of the course. If you have any questions about this crash course, leave them in the comments below.